Download "Significant Changes to the 2013 California Building Code Chapter 11B accessibility standards"
2 Chapter 3: Building Blocks Recommended Children s Reach Ranges Description: Revised recommended maximum reach range heights for elements that are designed for use primarily by elementary school age children. 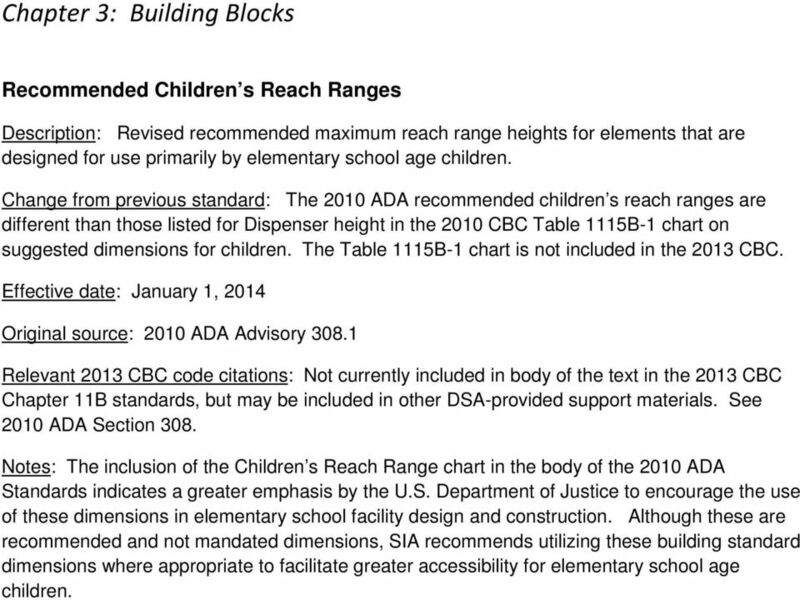 Change from previous standard: The 2010 ADA recommended children s reach ranges are different than those listed for Dispenser height in the 2010 CBC Table 1115B-1 chart on suggested dimensions for children. The Table 1115B-1 chart is not included in the 2013 CBC. Original source: 2010 ADA Advisory Relevant 2013 CBC code citations: Not currently included in body of the text in the 2013 CBC Chapter 11B standards, but may be included in other DSA-provided support materials. See 2010 ADA Section 308. Notes: The inclusion of the Children s Reach Range chart in the body of the 2010 ADA Standards indicates a greater emphasis by the U.S. Department of Justice to encourage the use of these dimensions in elementary school facility design and construction. Although these are recommended and not mandated dimensions, SIA recommends utilizing these building standard dimensions where appropriate to facilitate greater accessibility for elementary school age children. 3 Chapter 4: Accessible Routes Team or player seating Description: Sports activities which provide fixed seating areas for players shall provide at least one accessible wheelchair space to serve the areas of sports activity. Change from previous standard: The previous general requirement for accessibility is now a specific code reference in the 2010 ADA to require accessible wheelchair seating in player seating areas. Original source: 2010 ADA Sections and Relevant 2013 CBC code citations: Sections 11B , 11B and 11B Notes: An example of this would be a defined accessible wheelchair spaces adjacent to the player s benches in a gymnasium. In outdoor settings, this standard would also apply to player seating areas in a baseball dugout. However, the standard would not apply to a soccer field which generally does not provide a fixed player bench or seating area. Cross Slope and Level Landings Description: Accessible routes with cross slope and level landing requirements will be permitted to slope a maximum of 1:48 (2.1%) Change from previous standard: Maximum slope of 1:50 (2.0%) Original source: Multiple 2010 ADA code citations for cross slope and level landings. Relevant 2013 CBC code citations: Multiple code citations for cross slope and level landings. Notes: This change is made to maintain consistency with the International Building Code/ANSI standards. A SmartLevel is accurate to within 0.1%. Previously, a slope measurement would require a 2.2% to be definitively considered as noncompliant (outside the range for margin of error), but this would now be a 2.3% measurement. 4 Accessible Route: Areas of Sport Activity Description: An accessible route must be provided to connect to the boundary of each area of sports activity. 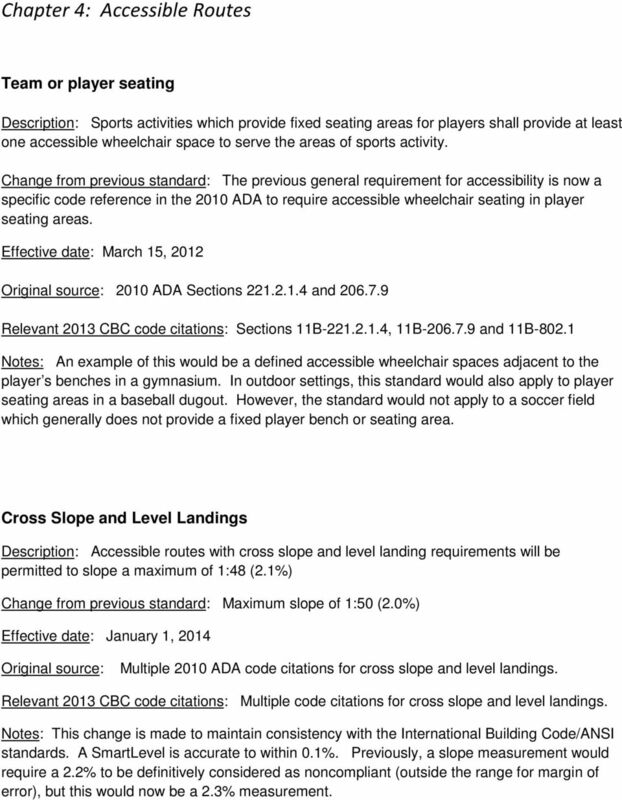 Change from previous standard: The previous general requirement for accessibility is now a specific code citation to require accessible routes to sports areas. Original source: 2010 ADA Advisory Relevant 2013 CBC code citations: Section 11B and 11B Notes: As referenced in the 2010 ADA Advisory statement, this includes soccer fields, basketball courts, baseball fields, running tracks, tennis courts or other areas of school sports activity. Where multiple sports fields or courts are provided, an accessible route is required to each field or area of sport activity. Accessible Route: Press Boxes Exceptions Description: Stadium press boxes will not be required to be on an accessible route under certain circumstances based on the aggregate size of one or more press boxes and the elevation above grade for free-standing press boxes. Change from previous standard: No exceptions allowed for providing accessibility to stadium press boxes. 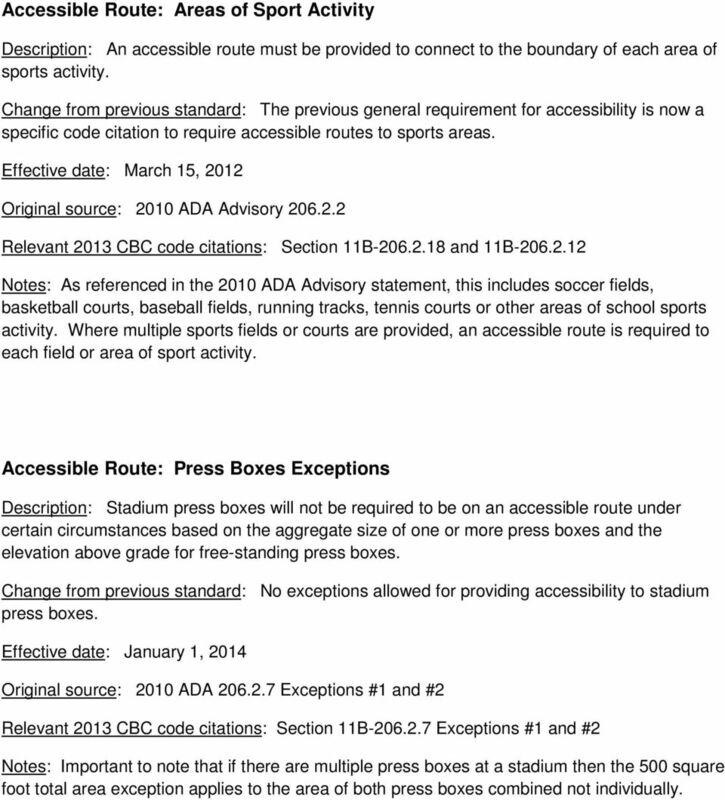 Original source: 2010 ADA Exceptions #1 and #2 Relevant 2013 CBC code citations: Section 11B Exceptions #1 and #2 Notes: Important to note that if there are multiple press boxes at a stadium then the 500 square foot total area exception applies to the area of both press boxes combined not individually. 6 Door/Gate Closing Speed Description: Doors/gates with closers require a minimum of 5 seconds for a door/gate to close from the 90 position to the 12 position. Doors/gates with spring hinges require a minimum of 1.5 seconds to close from the 70 to the closed position. 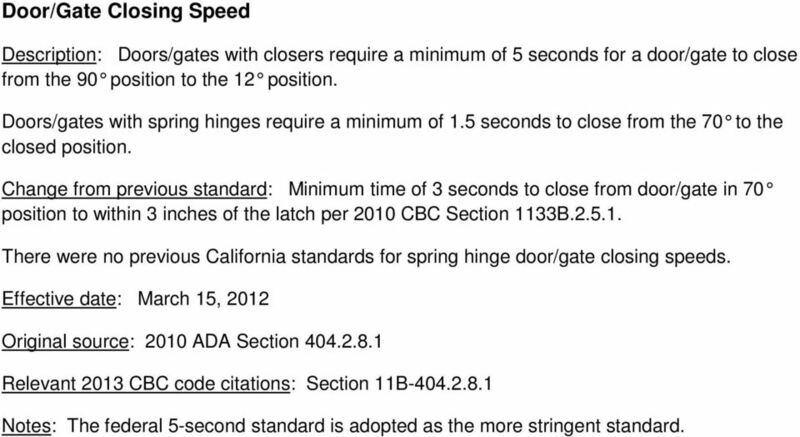 Change from previous standard: Minimum time of 3 seconds to close from door/gate in 70 position to within 3 inches of the latch per 2010 CBC Section 1133B There were no previous California standards for spring hinge door/gate closing speeds. Original source: 2010 ADA Section Relevant 2013 CBC code citations: Section 11B Notes: The federal 5-second standard is adopted as the more stringent standard. 7 Chapter 5: General Site and Building Elements Van accessible parking spaces Description: At least one van accessible parking space must be provided for every 6 or fraction of 6 total accessible parking spaces. Change from previous standard: At least one van parking space for every 8 or fraction of 8 total accessible parking spaces. 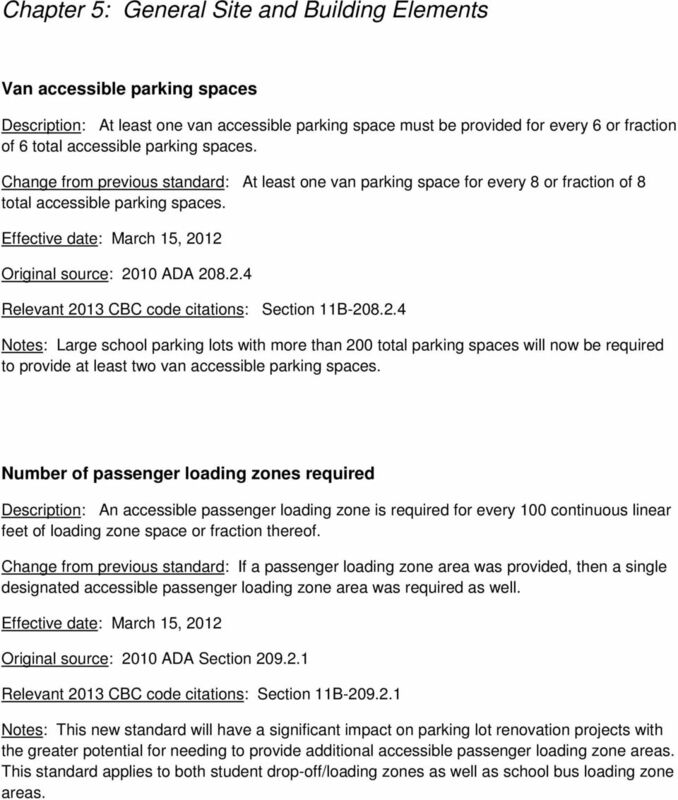 Original source: 2010 ADA Relevant 2013 CBC code citations: Section 11B Notes: Large school parking lots with more than 200 total parking spaces will now be required to provide at least two van accessible parking spaces. Number of passenger loading zones required Description: An accessible passenger loading zone is required for every 100 continuous linear feet of loading zone space or fraction thereof. Change from previous standard: If a passenger loading zone area was provided, then a single designated accessible passenger loading zone area was required as well. 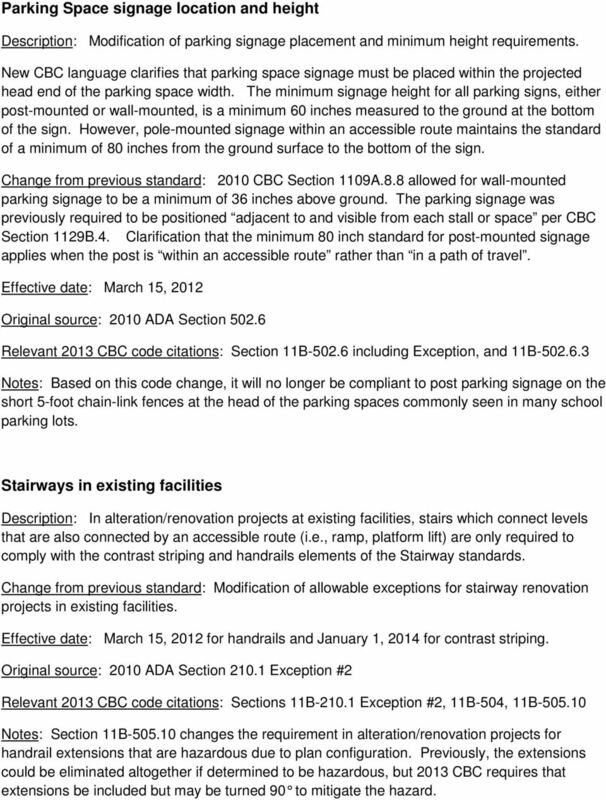 Original source: 2010 ADA Section Relevant 2013 CBC code citations: Section 11B Notes: This new standard will have a significant impact on parking lot renovation projects with the greater potential for needing to provide additional accessible passenger loading zone areas. This standard applies to both student drop-off/loading zones as well as school bus loading zone areas. 8 Passenger Loading Zone marked access aisles Description: Clarification of the passenger loading zone access aisle marking requirements including a new standard that the diagonal striping be separated by a maximum of 36 inches on center Change from previous standard: Passenger loading zones are currently required to provide marked access aisles, but with no specific description of the access aisle. Effective date: Existing standard Original source: 2010 CBC Section 1131B.2 and 2013 CBC 11B Relevant 2013 CBC code citations: Section 11B and Figure 11B Notes: The 2013 CBC adds Figure to clearly illustrate that a marked passenger access aisle is required beside the vehicle pull-up space. This 5 x 20 marked access is the equivalent to the access aisle beside an accessible parking space as is made clear by the new requirement for 36 on center diagonal striping. Angled accessible parking space Description: More detailed identification of parking space and access aisle length requirements for angled accessible parking spaces. 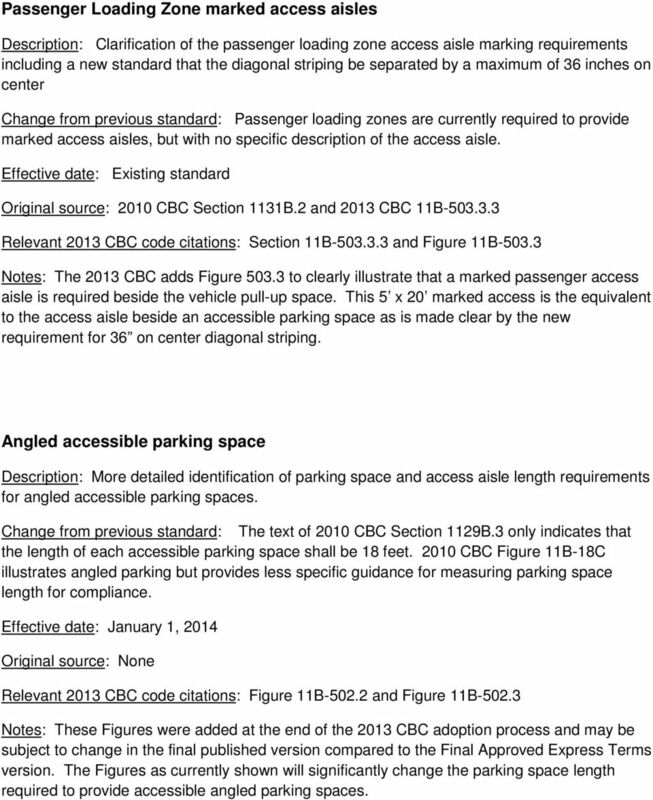 Change from previous standard: The text of 2010 CBC Section 1129B.3 only indicates that the length of each accessible parking space shall be 18 feet CBC Figure 11B-18C illustrates angled parking but provides less specific guidance for measuring parking space length for compliance. Original source: None Relevant 2013 CBC code citations: Figure 11B and Figure 11B Notes: These Figures were added at the end of the 2013 CBC adoption process and may be subject to change in the final published version compared to the Final Approved Express Terms version. The Figures as currently shown will significantly change the parking space length required to provide accessible angled parking spaces. 9 Parking Space signage location and height Description: Modification of parking signage placement and minimum height requirements. New CBC language clarifies that parking space signage must be placed within the projected head end of the parking space width. The minimum signage height for all parking signs, either post-mounted or wall-mounted, is a minimum 60 inches measured to the ground at the bottom of the sign. However, pole-mounted signage within an accessible route maintains the standard of a minimum of 80 inches from the ground surface to the bottom of the sign. Change from previous standard: 2010 CBC Section 1109A.8.8 allowed for wall-mounted parking signage to be a minimum of 36 inches above ground. The parking signage was previously required to be positioned adjacent to and visible from each stall or space per CBC Section 1129B.4. Clarification that the minimum 80 inch standard for post-mounted signage applies when the post is within an accessible route rather than in a path of travel. Original source: 2010 ADA Section Relevant 2013 CBC code citations: Section 11B including Exception, and 11B Notes: Based on this code change, it will no longer be compliant to post parking signage on the short 5-foot chain-link fences at the head of the parking spaces commonly seen in many school parking lots. Stairways in existing facilities Description: In alteration/renovation projects at existing facilities, stairs which connect levels that are also connected by an accessible route (i.e., ramp, platform lift) are only required to comply with the contrast striping and handrails elements of the Stairway standards. Change from previous standard: Modification of allowable exceptions for stairway renovation projects in existing facilities. for handrails and January 1, 2014 for contrast striping. Original source: 2010 ADA Section Exception #2 Relevant 2013 CBC code citations: Sections 11B Exception #2, 11B-504, 11B Notes: Section 11B changes the requirement in alteration/renovation projects for handrail extensions that are hazardous due to plan configuration. Previously, the extensions could be eliminated altogether if determined to be hazardous, but 2013 CBC requires that extensions be included but may be turned 90 to mitigate the hazard. 11 Chapter 6: Plumbing Elements and Facilities Ambulatory accessible toilet compartments Description: In large Toilet Facility restrooms, an ambulatory accessible toilet compartment (AATC) must be provided for every six fixtures including the combination of urinals and water closets. 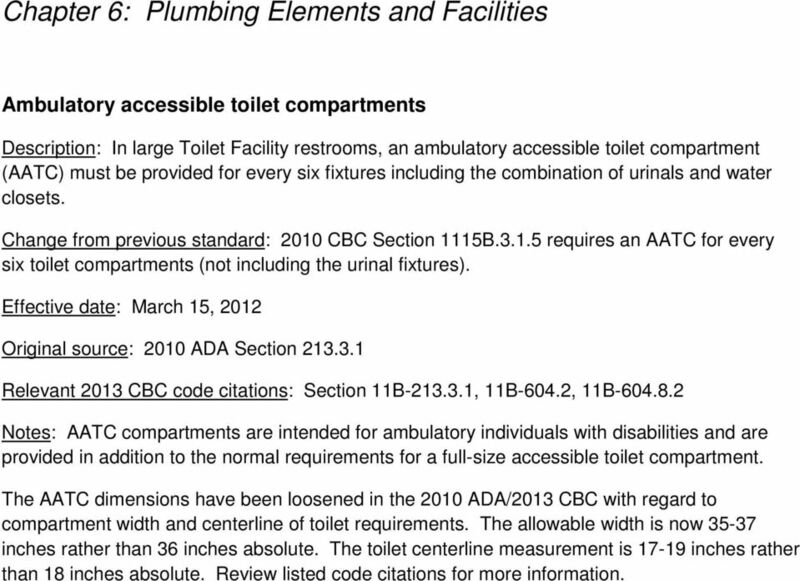 Change from previous standard: 2010 CBC Section 1115B requires an AATC for every six toilet compartments (not including the urinal fixtures). Original source: 2010 ADA Section Relevant 2013 CBC code citations: Section 11B , 11B-604.2, 11B Notes: AATC compartments are intended for ambulatory individuals with disabilities and are provided in addition to the normal requirements for a full-size accessible toilet compartment. 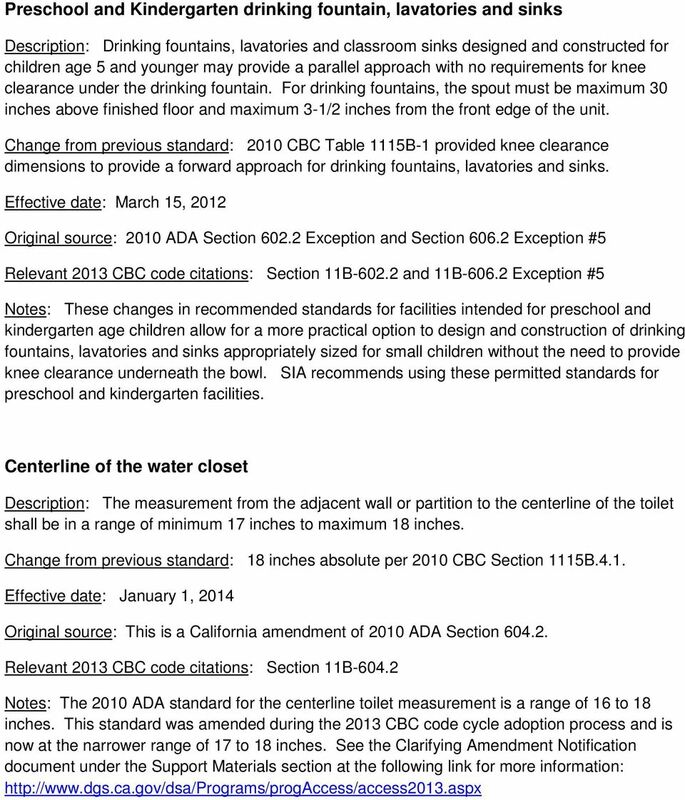 The AATC dimensions have been loosened in the 2010 ADA/2013 CBC with regard to compartment width and centerline of toilet requirements. The allowable width is now inches rather than 36 inches absolute. The toilet centerline measurement is inches rather than 18 inches absolute. Review listed code citations for more information. 12 Children s water closet and toilet compartment dimensions Description: Suggested restroom element dimensions including water closet centerline, toilet seat height, grab bar height and toilet paper dispenser height for preschool and elementary school children s restrooms. Change from previous standard: The suggested dimensions are primarily dimensional ranges rather than the minimum and maximum dimensions referred to in 2010 CBC Table 1115B-1. 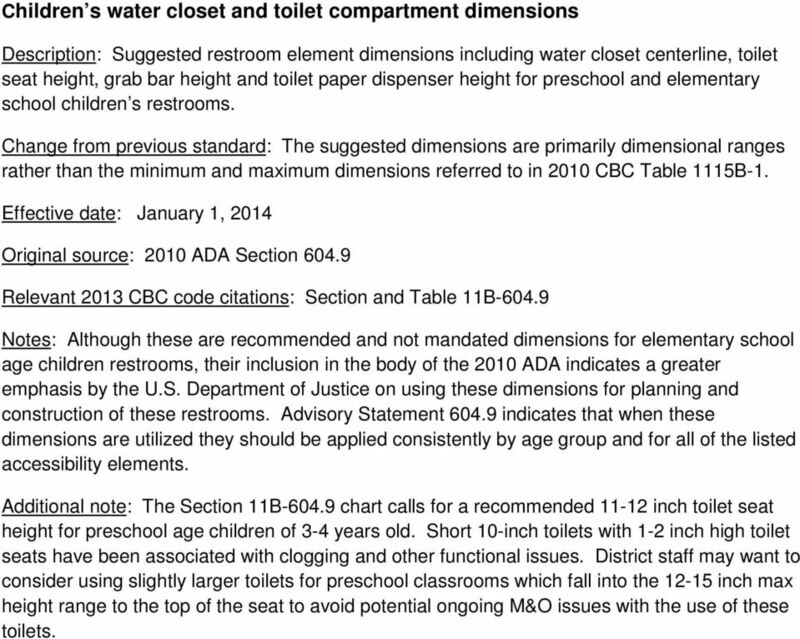 Original source: 2010 ADA Section Relevant 2013 CBC code citations: Section and Table 11B Notes: Although these are recommended and not mandated dimensions for elementary school age children restrooms, their inclusion in the body of the 2010 ADA indicates a greater emphasis by the U.S. Department of Justice on using these dimensions for planning and construction of these restrooms. Advisory Statement indicates that when these dimensions are utilized they should be applied consistently by age group and for all of the listed accessibility elements. Additional note: The Section 11B chart calls for a recommended inch toilet seat height for preschool age children of 3-4 years old. Short 10-inch toilets with 1-2 inch high toilet seats have been associated with clogging and other functional issues. District staff may want to consider using slightly larger toilets for preschool classrooms which fall into the inch max height range to the top of the seat to avoid potential ongoing M&O issues with the use of these toilets. 15 Urinal Depth Description: Wall-hung or stall-type urinals are required to have a minimum depth of 13-1/2 inches measured from outer face of the rim to the back of the fixture. 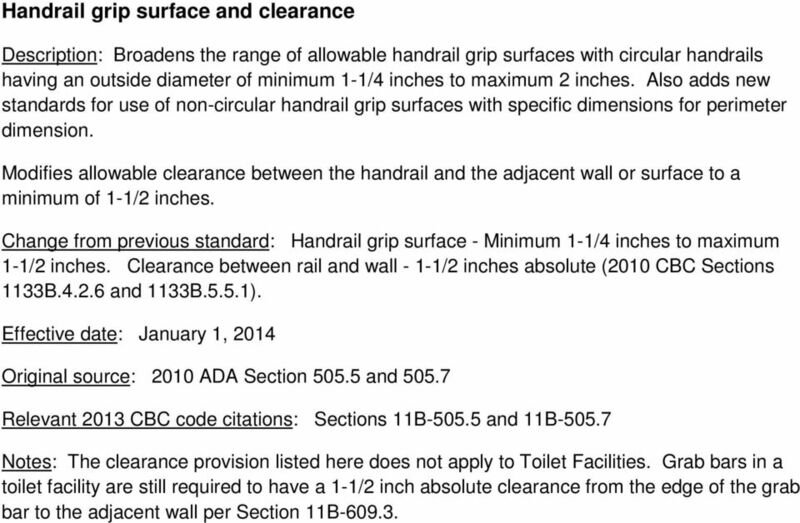 Change from previous standard: Minimum 14 inches to maximum 17 inch urinal depth per 2010 CBC 1115B.4.2. 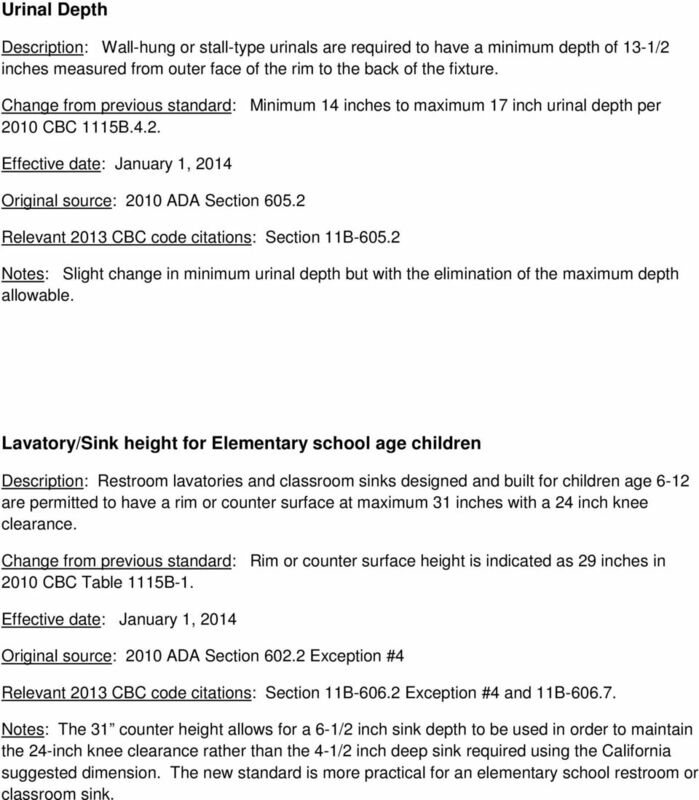 Original source: 2010 ADA Section Relevant 2013 CBC code citations: Section 11B Notes: Slight change in minimum urinal depth but with the elimination of the maximum depth allowable. Lavatory/Sink height for Elementary school age children Description: Restroom lavatories and classroom sinks designed and built for children age 6-12 are permitted to have a rim or counter surface at maximum 31 inches with a 24 inch knee clearance. Change from previous standard: Rim or counter surface height is indicated as 29 inches in 2010 CBC Table 1115B-1. Original source: 2010 ADA Section Exception #4 Relevant 2013 CBC code citations: Section 11B Exception #4 and 11B Notes: The 31 counter height allows for a 6-1/2 inch sink depth to be used in order to maintain the 24-inch knee clearance rather than the 4-1/2 inch deep sink required using the California suggested dimension. The new standard is more practical for an elementary school restroom or classroom sink. 16 Chapter 7: Communication Elements and Features Tactile signage placement height Description: Tactile signage identifying permanent rooms and spaces is required to be positioned at a maximum height of 60 inches to the baseline of the highest line of raised alpha characters and minimum 48 inches to the baseline of the Braille cells Change from previous standard: 60 inches on center above the finished floor per 2010 CBC Section 1117B.5.7. 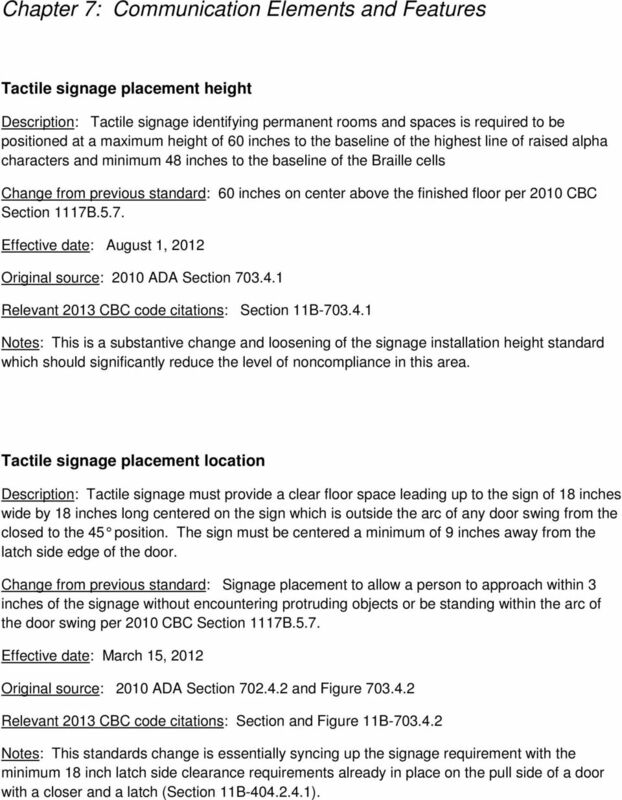 Effective date: August 1, 2012 Original source: 2010 ADA Section Relevant 2013 CBC code citations: Section 11B Notes: This is a substantive change and loosening of the signage installation height standard which should significantly reduce the level of noncompliance in this area. Tactile signage placement location Description: Tactile signage must provide a clear floor space leading up to the sign of 18 inches wide by 18 inches long centered on the sign which is outside the arc of any door swing from the closed to the 45 position. The sign must be centered a minimum of 9 inches away from the latch side edge of the door. Change from previous standard: Signage placement to allow a person to approach within 3 inches of the signage without encountering protruding objects or be standing within the arc of the door swing per 2010 CBC Section 1117B.5.7. 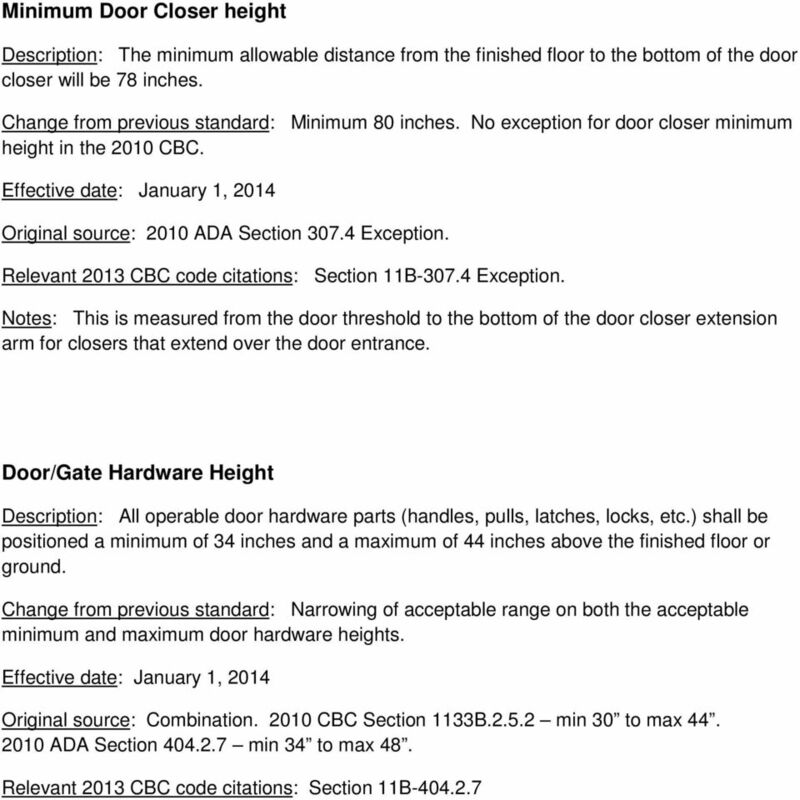 Original source: 2010 ADA Section and Figure Relevant 2013 CBC code citations: Section and Figure 11B Notes: This standards change is essentially syncing up the signage requirement with the minimum 18 inch latch side clearance requirements already in place on the pull side of a door with a closer and a latch (Section 11B ). 18 Chapter 9: Built-in Elements Dining surfaces and work surfaces for Children s Use Description: The tops of tables and counters for dining and work surfaces intended for children age 6-12 as the primary users is required to be a minimum of 26 inches and a maximum of 30 inches above the finish floor or ground. The knee and toe clearance for these tables and counters is 24 inches minimum above finish floor or ground Change from previous standard: This standard is new to the 2013 CBC but was added to the federal ADA Accessibility Guidelines in 1998 as a non-enforceable standard. 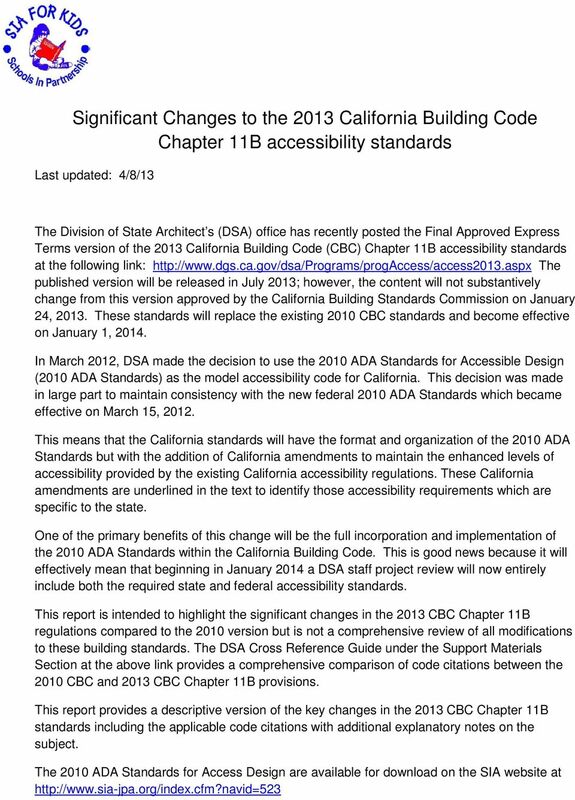 Original source: 1991 ADA Accessibility Guidelines Section as amended in Relevant 2013 CBC code citations: Section 11B and 11B Notes: This is a required accessible building standard in the 2013 CBC. It is not a recommend or suggested dimension as is the case with toilet facility element dimensions for children as referenced in Table 11B It is applicable to cafeteria tables and counters, classroom/library computer work stations and other dining/work surfaces intended for use by elementary school age children. 19 Chapter 10: Recreation Facilities Play Areas Description: Significant broadening of the requirements for play areas with new standards for numbers and type of accessible play components, accessible routes, transfer systems, etc. Change from previous standard: General California provisions for accessibility of play areas but no specific building or equipment standards. Original source: 2010 ADA Sections 240 and 1008 Relevant 2013 CBC code citations: Sections 11B-240 and 11B-1008 Note: The 2013 CBC has added a requirement that play equipment stairs must provide contrast striping as is required on all other interior and exterior stair treads. (Sections 11B Exception #4 and 11B ) Accessible swimming pools Description: Detailed standards for accessible means of entry and exit to swimming pools with new requirements for pool lifts, other types of pool access, and the number of accessible means of entry needed based on the size of the pool. Change from previous standard: The 2010 and previous versions of the CBC have included Section 1104B which include technical building standards for pool lift equipment. The new 2010 ADA standards both broaden and expand on these provisions. 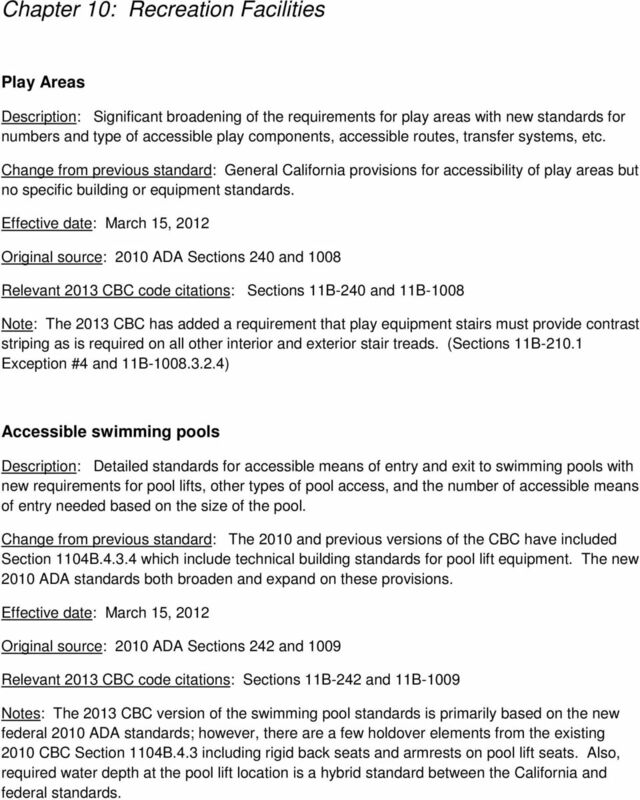 Original source: 2010 ADA Sections 242 and 1009 Relevant 2013 CBC code citations: Sections 11B-242 and 11B-1009 Notes: The 2013 CBC version of the swimming pool standards is primarily based on the new federal 2010 ADA standards; however, there are a few holdover elements from the existing 2010 CBC Section 1104B.4.3 including rigid back seats and armrests on pool lift seats. Also, required water depth at the pool lift location is a hybrid standard between the California and federal standards. 20 Exercise machines and equipment Description: At least one of each type of exercise machine and equipment in an exercise room is required to provide an accessible route to that area and a clear floor space adjacent to allow for use of the equipment or transfer by an individual in a wheelchair. 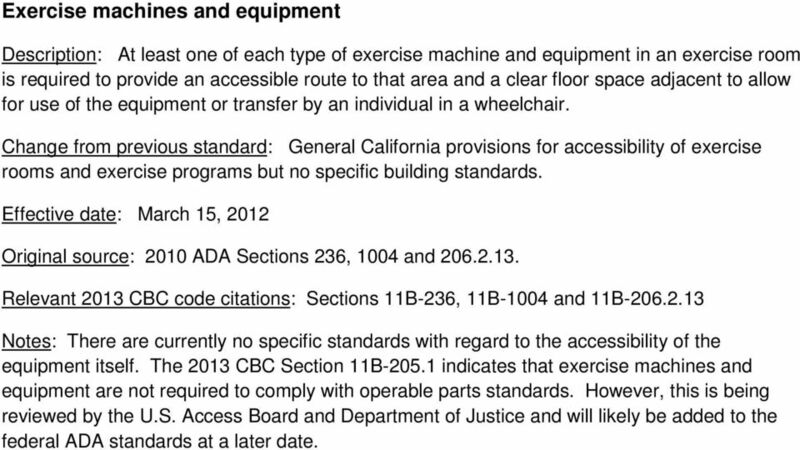 Change from previous standard: General California provisions for accessibility of exercise rooms and exercise programs but no specific building standards. Original source: 2010 ADA Sections 236, 1004 and Relevant 2013 CBC code citations: Sections 11B-236, 11B-1004 and 11B Notes: There are currently no specific standards with regard to the accessibility of the equipment itself. The 2013 CBC Section 11B indicates that exercise machines and equipment are not required to comply with operable parts standards. However, this is being reviewed by the U.S. Access Board and Department of Justice and will likely be added to the federal ADA standards at a later date. 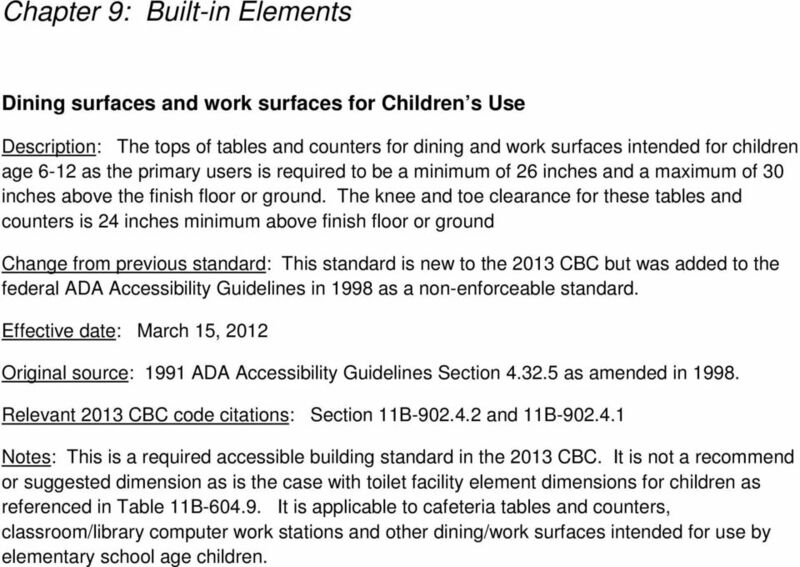 21 Addendum: Significant changes to the 2010 CBC Chapter 11B accessibility standards (not new to the 2013 CBC) These changes were new to the 2010 CBC Chapter 11B standards will continue to have an impact on design and construction of school facility renovation/modernization projects. Reach range Description: The overall range for side reach is narrowed to a minimum height of 15 inches and a maximum height of 48 inches. 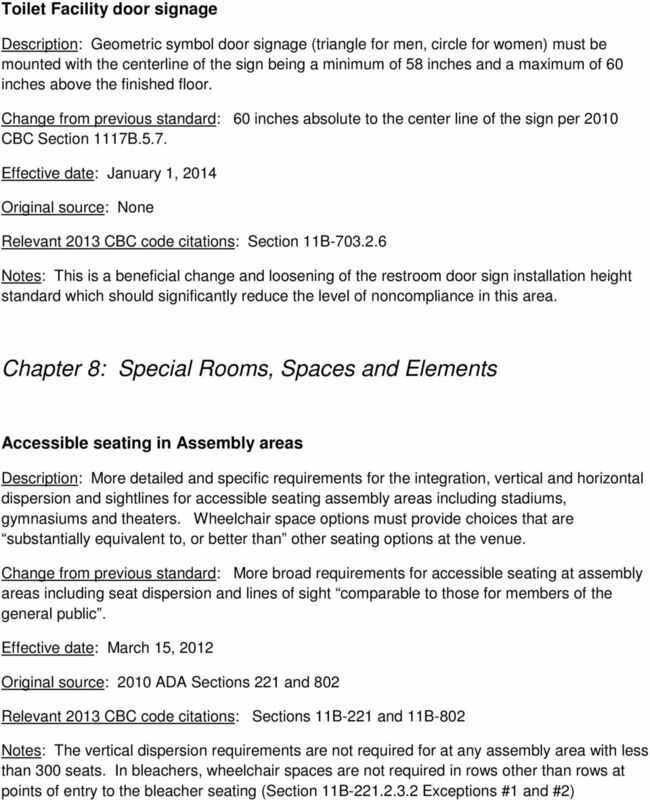 The entire 2010 CBC Section 11118B.5 and 1118B.6 sections are rewritten to coincide with 2010 ADA Section 308. Change from previous standard: Minimum 9 inch to maximum 54 inch unobstructed side reach range and other changes based on size of obstructions. Effective date: January 1, 2011 Original source: ADA Section 308 Relevant 2013 CBC code citations: Section 11B-308 Notes: The 2013 CBC does add language to clarify that electrical switches and electrical outlets should be entirely within the acceptable reach ranges with the high reach being measured to the top of the outlet box and the low end to the bottom of the outlet box. Standby power for platform lifts Description: Platform lifts are required to provide standby power or self-rechargeable battery power to ensure continued operation for 5 up and down trips in the event of a primary power loss. Change from previous standard: Standby power or self-rechargeable batteries were required only if the lift was determined to be a component of the accessible means of egress. Effective date: January 1, 2011 Original source: ADA Section Relevant 2013 CBC code citations: Section 11B Notes: Auxiliary standby power will be an add-on option rather than part of the standard package for most platform lifts. Districts should only purchase platform lifts which provide the standby power/rechargeable battery option to maintain compliance with this standard. 22 Water Closet and Toilet Compartment clearance Description: All water closets are required to provide a minimum of 60 inches of clear floor space around the water closet measured from the side wall closest to the water closet to allow for a side transfer to the toilet. Additionally, other maneuvering space, clear floor space, and door swing code changes as indicated in 2010 CBC Sections 1115B and 1115B and Figure 11B-1E. Change from previous standard: Previously only toilet compartments in multi-accommodation restrooms were required to provide a minimum 60 clear width around the water closet, but not single-accommodation restrooms which allowed a minimum of 28 inches from the edge of the toilet to the edge of the nearby lavatory as shown in Figure 11B-1B. 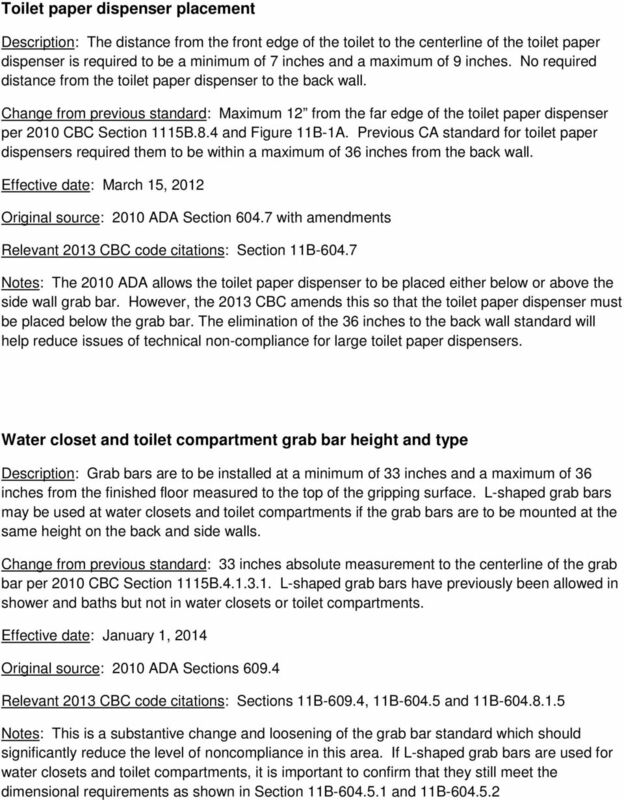 Effective date: January 1, 2011 Original source: 2010 ADA Section Relevant 2013 CBC code citations: Section 11B and Figure 11B Notes: The significance of this code change is that lavatories must be placed further away from the water closet in single toilet restrooms to allow for the minimum clear width. This will impact restroom alteration/renovation projects which may need to move fixtures in order to achieve compliant clearances around the water closet. Consolidation of the National Building Code - Section 3.8., Barrier-Free Design to include Manitoba Building Code amendments pertaining to Section 3. Consolidation of the National Building Code - Section 3.8., Barrier-Free Design to include Manitoba Building Code amendments pertaining to Section 3.8 Section 3.8. Barrier-Free Design 3.8.1. General 3.8.1.1.